Dozens of residents of the village of Baheeg in Assiut, Upper Egypt, burnt three houses owned by a Christian family after a Christian villager allegedly published cartoons mocking Islam on his Facebook account. A number of Muslim students attacked their Coptic classmate for posting the cartoons, a Muslim student told Al-Masry Al-Youm. "One era has ended," said [91-year-old Gamal] Banna, one of Islam's leading liberal thinkers. "But of the new era, we don't know exactly what is taking shape." ...His older brother, Hassan, who was a schoolteacher, founded the Muslim Brotherhood in 1928. The younger Banna has often angered the group with his progressive interpretation of Islam..."The revolution," he said, "has lost its freedom." Well, that seems very certain and justifies what I and my more informed colleagues had said right at the beginning, that all this talk about democracy was wishful thinking when considering the forces of Islamism and the reality. More, from Zev Rothkoff's site. And at Betar. "the desecration of graves in an organized and systematic fashion. Seventy per cent of the gravestones were destroyed. Three army camps were built on the site using the gravestones for paving. 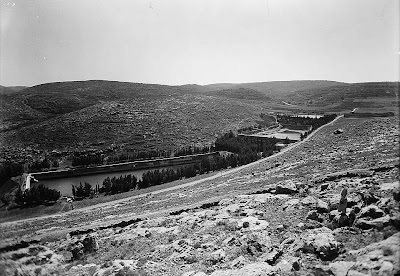 The Jerusalem-Jericho highway was widened into the cemetery area on the graves and the Sefaradi section was covered over in dumped soil for the construction of a parking area." And, by the way, desecration continues. And also here. Here, too. That is so not proper, nice or cultured. Could they have been on this tour? 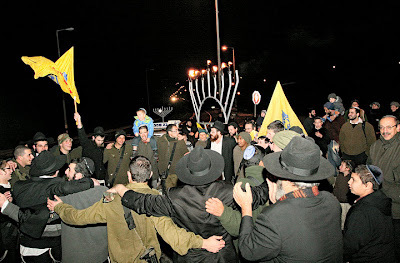 BETHLEHEM, December 30, 2011 (WAFA) – Around 200 armed Israeli settlers paraded in the town of al-Khader, south of Bethlehem Friday morning and walked around the convention center and nearby Solomon’s Pools, said local activists. Awad Abu Sway, member of the local anti-settlements committee, said the settlers, protected by Israeli soldiers, took pictures of the convention center and the pools and held prayers in the area. 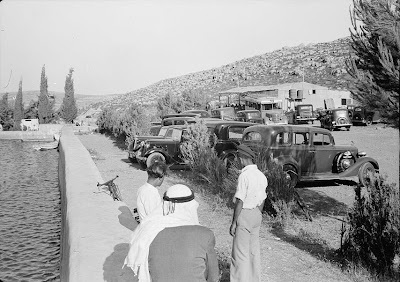 The settlers then left the area and went to another neighborhood of al-Khader, where a settlement outpost was erected. משפחות מיטיבות לכת: מוזמנות להאריך את חופשת החנוכה ולבוא עם הילדים לחוויה בלתי נשכחת סיור בבריכות שלמה המפוארות. נדון במנהרת דהר דקו, נבקר בעין עיטם ונמשיך לעין פרוג'ה ולבריכות שלמה המפוארות, שלצידן עין אל בורק, עין אל קלעה ועין צלח, ומהן הוליכו אמות מים לירושלים של בית שני, לבית המקדש, ולמבצר ההרודיון שבמורד נחל תקוע באמה פחות מוכרת. לאחר סיום הביקור בבריכות שלמה נעלה על הרכבים וניסע לכניסה לביתר עלית - עיר התורה והחסידות בהרי יהודה. בערך בשעה 09:00 נצא לטיול מעיינות סביב ביתר עלית. נרד דרך עין אל מסיר לכיוון עין אל בלד והעיר נחלם המקראית, נמשיך למנזר הביזנטי א-דיר ולעין פרס, נספר את סיפור הקרב שהיה במקום במאה ה7 לספירה בין המוסלמים לביזנטים, נמשיך למצודה מבית ראשון ונרד לשלל בריכות השחיה והמעיינות התחתונים של ואדי פוכין. משם נעלה לעין א-טקה ולחמשת המעיינות של זעבוב ופיקיה. המסלול למיטיבי לכת 14 ק"מ (קובץ עם מפה מצורף). שעת סיום משוערת 13:30, ניתן לפרוש במספר נקודות באמצע. נשמח על כול נשק שיובא לטיול, בעיקר נשק ארוך. "Hiking Peers", do not miss the opportunity to visit the Solomon pools + a trip to the springs around Beitar Illit - under the guidance of Amit Ararat. come with children memorable grand tour complete pools. 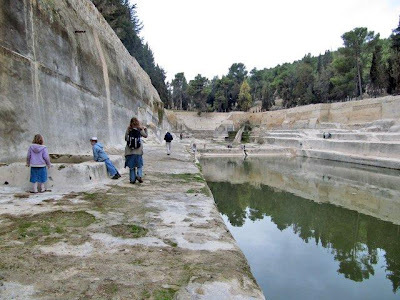 visit Ein Etam and will continue to eye Perugia and pools complete luxury...aqueducts to Jerusalem's Second Temple, the Temple, and the fortress Herodian downstream. 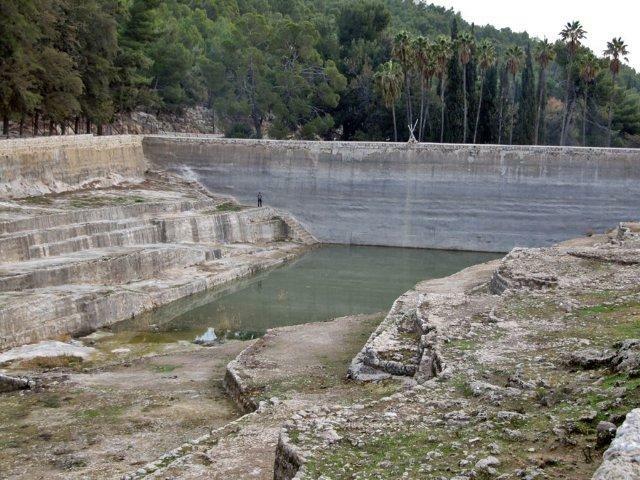 After the visit to Solomon pools superior to the vehicles and drive to the entrance of Betar Illit - City of Torah and Hasidism in the Judean Hills. At about 9:00 we walk springs around Beitar Ilit. Descend through the spring...continue Byzantine monastery we will tell the story of the battle was instead century 7th century between Muslims and Byzantines, we will continue the fort from the first and go to many swimming pools and springs in the bottom of Wadi Fukin. From there we will view a - Tekoa and five springs of Zabov and producers. Route for serious walkers 14 km (with map attached file). Estimated end time 13:30, you can retire the number of points in between. Rabbi Ovadia Yosef, in his 51st volume of Responsa, and deals with the Ashkenazi tradition of eating gefilte fish on the Shabbat. In the book, the rabbi permits the removal of the carp's small bones on Shabbat, explaining that this does not institute a violation of the "borer" law. This means that Shabbat may be stripped of its weekly dose of gefilte fish, in favor of whole fish. Actually, we Ashkenazim love gefilte fish so there is no way we're giving it up. Not for all the Sefaradi pilpul in the world. Arabs Foil Hillary But Will EU Follow US? Egyptian security forces on Thursday raided the offices of 17 nongovernmental organizations, including three U.S.-based agencies, as part of a crackdown on foreign assistance that has drawn criticism from the West and threatened human rights groups and pro-democracy movements. The move appeared to be part of a strategy to intimidate international organizations...The military's actions angered Washington at a time the White House is pressuring Egypt to respect civil liberties..."This action is inconsistent with the bilateral cooperation we have had over many years," State Department spokeswoman Victoria Nuland said at a news briefing after the raids. "We call on the Egyptian government to immediately end the harassment of NGO staff, return all property and resolve this issue immediately." QUESTION: What do you think this says more broadly about Egypt’s commitment to democracy? MS. NULAND: Well, again, as you know, we believe that these NGOs are there to support the democratic process. Some of these are institutions that are supported by the United States Government, that work around the world in the interests of helping citizens realize their goals of democratic processes taking root in their country. And we have been very open and transparent with Egyptian authorities at all levels, particularly about the operating procedures and policies of NDI, IRI, and other international – other NGOs that we support. So we are very concerned, because this is not appropriate in the current environment. I wonder: is the US open with Israel about its support, as well? And if so, as it should be expected to be, will the EU follow suit and act the honorable way with transparency as regards their interventionist policies? The rest, taken by Miriam-Feyga Bunimovich, are here. Want the latest really bad news from Hams? Violence. Jihad. Martyrdom. Armed Resistance. Now you know Pal. claims are wrong. The lowest area of the slope on the eastern side of the Temple Mount towards the Kidron Valley has never been systematically excavated...At several locations antiquities were encountered, and the digging was stopped...Among the layers was a deposit of refuse aggregates dated to the late Second Temple Period, and were part of a large city dump of that period...At the same location, the remains of a human burial were also spotted penetrating the Second Temple Period aggregates. This burial site should be dated probably to the Byzantine Period. ...Quantitative analysis of the distribution and classification of the finds also yielded valuable information when compared to other sites in Jerusalem and outside it...The pottery from the First Temple Period was dated to the Iron Age IIA (10th – 9th century BCE) – Iron Age IIB (8th century), while the Second Temple Period pottery was dated to the Second Century BCE – First Century CE. The appearance of pottery from the early phases of the Iron Age II was surprising due to the scarcity of such remains in Jerusalem, especially outside the City of David. ...a few biblical references that imply the existence of a garbage dump at Kidron valley near the Temple Mount (see 1 Kings 15:11-14; 2 Kings 23:4-12; 2 Chronicles 29:15; 2 Chronicles 30:14; Jeremiah 31:40). 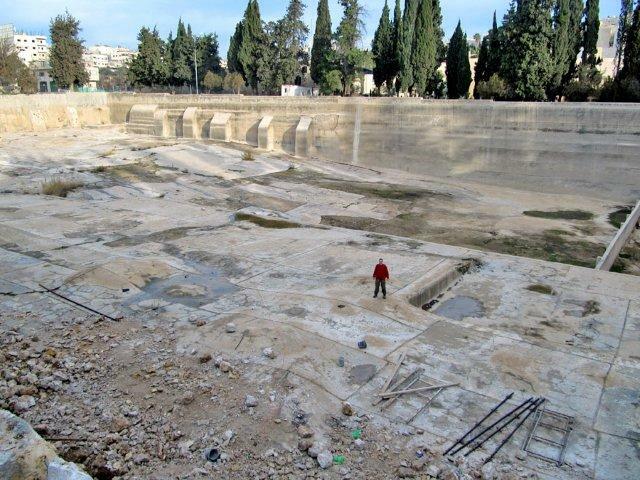 These accounts and the existence of such a refuse pit near the stream of the Kidron Valley at its western bank and its special finds may indicate that the refuse in the pit we have recovered originates from the Temple Mount. 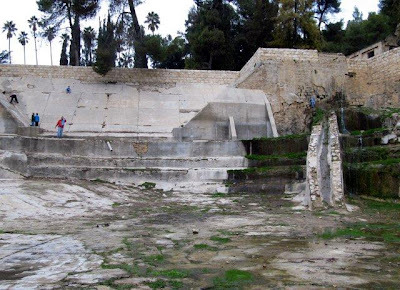 We sincerely believe that further excavations at the site and its vicinity will shed much light on the activity that took place on the Temple Mount and about the refuse patterns of the First and Second Temple Periods. A small fragment of a clay bulla was discovered in the wet sifting carried out at Tzurim Valley National Park, the site of the Temple Mount Sifting Project. The bulla carries an Ancient Hebrew inscription: “[g]b’n/lmlk“, i.e. “Gibeon, for the King”...This bulla enables us to fully illuminate and discuss the entire phenomenon of the fiscal bullae...The discovery of the fiscal bulla with the name of Gibeon from the slope of the Temple Mount, authenticates all the other fiscal bullae, and enables us to study a variety of subjects connected to the history of Judah in the 7th century BCE. After all the hullabaloo about female exclusion and the general collapse of Israeli democracy, is this the new Israel reality? Religious police composed of volunteers that enforce the Halacha. Armed with thin wooden canes, the groups roam the streets enforcing dress codes, separation between the sexes, prayer, and other behavior believed to be commanded by Judaism and using tasers. That's the new Egyptian reality. And a second one here. What Is Thomas Friedman Doing? Well, he's having breakfast at New York’s Loews Regency hotel located on the corner of 61st Street and Park Avenue with Lebanese Ambassador to the United Nations Nawaf Salam. ...cops say Calvin Hubbard sneaked into the women's restroom at the Coconut Grove Sports Bar and Grill along J Street. He hid there until the bar closed for the night...After everyone had left, Hubbard allegedly helped himself to the alcohol behind the bar. Cops say he drank heavily and fell asleep...woke up early Wednesday morning [and] stumbled around the closed bar and found his way to the freezer for some ice cream. There is a burglar alarm on the bar's fridge and freezer. After eating, Hubbard fell back asleep on an employee couch. 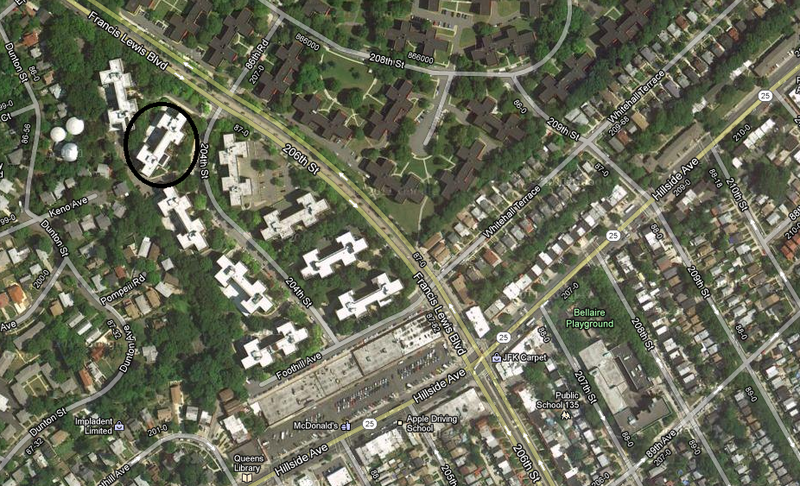 That's where Corpuz and cops found him sleeping with his shoes off around 9 a.m. ...The treatment of women in Arab and Moslem countries is so atrocious that space here would not allow for even a superficial survey. In the very same week that Iran announced that a woman convicted of adultery would be mercifully hanged to death instead of stoned to death, the Obama team could find nothing more deserving of condemnation than the treatment of women in the only country in the Middle East in which women are treated as humans deserving of equal rights. Private - or Putative - Land? Accusing Israeli Jews of “stealing private Palestinian land,” condemning “settlements” as “illegal,” “violations of international law” and “the occupation” are powerful weapons in the war to demonize and delegitimize Israel...[However,] Because land on which most settlements are built is not agriculturally useful, Arabs did not claim ownership until recently. ...what constitutes “private Palestinian land” and who decides what is and what is not private Palestinian land? If it is true that Jews are stealing land, this violates Jewish and Israeli laws and values and justifies calls for boycotts, sanctions and even the elimination of the state, since it applies to areas acquired after 1948 as well as in 1967. A devastating moral and legal indictment, it would undermine Israel’s moral foundation, its raison d’etre...Promoted by Arab propagandists and their supporters...[it is] A poisoned narrative based on ignorance and/or misunderstanding, it is a lie. Based on titles and deeds, land that is registered becomes private property. But what if there are no documents to prove ownership? ...Until the modern period, land registration, especially in sparsely populated areas like the Middle East, Africa and North Africa was not widely practiced. ...According to Dr. Dov Gavish, who wrote the only extensive study of this topic, Survey of Palestine, 1920-1948 (2005)(*), [during the Mandate period] maps were drawn based on where inhabitants were found and on verbal claims, usually by local mukhtars (chiefs) and sheikhs, not on documents or land registration. [here is some more important background information] Based on aerial photos and evidence of cultivation, villages were arbitrarily divided into 60-hectare (about 148-acre) blocks, which were then sub-divided among local peasants. Highly inaccurate, these fiscal maps nevertheless became the basis for taxation. They did not and do not reflect legal ownership...the registration process lacked legal procedures for determining proper (actual) ownership...Most of what is called “private Palestinian land” is claimed – and some registered – based on policies that legitimized squatting after the fact and by counting land as “owned” when in fact it had been leased, or simply used. 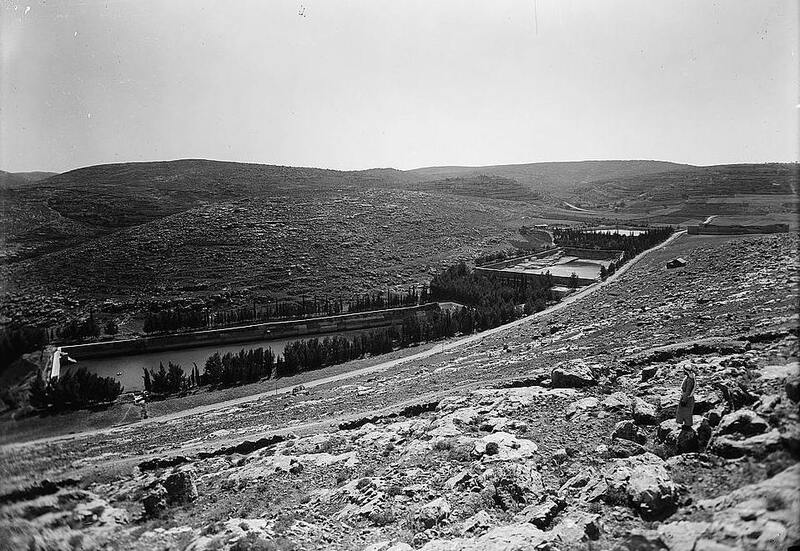 ...Because land on which most settlements are built is not agriculturally useful, Arabs did not claim ownership until recently, when anti-settlement NGOs asserted that these lands belonged to Arabs, individually and/or collectively based on hearsay, maps and documents that are grossly inaccurate and often false. The Claim of Dispossession: Jewish Land Settlement and the Arabs, 1878-1948 by Aryieh L Avneri. This study sheds new light on the historic background of the contemporary Palestinian problem. Avneri traces the spread of Jewish settlements over the seventy-year period before the establishment of the State of Israel, in order to see how it affected the existing Arab community's economy and social and cultural institutions. He demonstrates that there is no historical evidence for the eviction of the Palestinians from Israel previous to the founding of the state. Most of those who left afterwards did so on their own volition. And back in 1985, Eyal Zamir, now at Hebrew U. and Harvard, authored "STATE LAND IN JUDEA AND SAMARIA – THE LEGAL STATUS" (The Jerusalem Institute for Israel Studies, Jerusalem, 1985) 75 pp., including Summary in English, which also affords an understanding of the issue. Did you know the IDF has a site dealing with some of the issues of land? Gender discrimination be exposed and dealt with, but it is unfair to put the whole onus on one community. My son's team won again. Football here is catching on. Just days before the New England Patriots took on the Miami Dolphins this week ... Robert Kraft's son was focused on another big football game ... in Israel. ...Daniel Kraft flew into Jerusalem a few days ago to check in on the Israel Football League ... a 10-team semi-pro organization largely supported by the Kraft family. The family is so involved with the league -- the field was named Kraft Stadium. 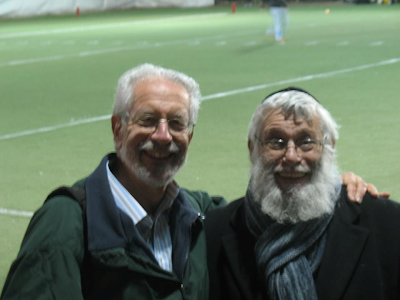 On Thursday, Daniel and his son were honored at the annual Hanukkah Bowl -- with his son lighting the menorah on night #3. After Daniel greeted the crowd in Hebrew, the Judean Rebels beat the living kreplach out of the Jerusalem Kings ... 66 to 20. Pigskin -- finally kosher in Israel. Do You Like Manischewitz Wine? Patrick "Deep Dish" Bertoletti -- who currently holds the world record for downing nearly 17 corned beef sandwiches in 10 minutes -- went down in Hanukkah history on Friday ... guzzling two full bottles of Manischewitz in less than a minute. The competitive eater pulled the stunt in celebration of the Festival of Lights -- despite not even being Jewish. Now that's a mensch. There's a video there of the action but I couldn't bring myself to upload it here. I left a comment at a Canadian newspaper here. The late-13th-century B.C.E. Merneptah Stele has long been known for containing the earliest reference to Israel outside of the Bible. But now three German scholars say they may have found another hieroglyphic inscription almost 200 years older naming “Israel.” The Bible may be more accurate than some thought. I wonder if Hamdan Taha, Director of the Palestinian Department of Antiquities and Cultural Heritage, reads the journal. At the press conference to announce the find, archaeologists were flanked by two government ministers from the right-wing Likud party who used the discovery to press Jewish claims of sovereignty over Jerusalem. The international community does not recognize Israeli sovereignty over East Jerusalem, where the excavation is located, and Palestinians consider the eastern part of the city as the capital of their future state. Nor Hareidim. Not "hilltop youth". A brawl has erupted between rival clergymen participating in an annual cleaning ritual at the church built at Jesus' traditional birthplace. Palestinian police officers intervene in a fight that erupted between Greek Orthodox and Armenian clergymen during the cleaning of the Church of the Nativity in the West Bank town of Bethlehem, Wednesday, Dec. 28, 2011. The two denominations each control sections of the church and fiercely guard their turf. The violence broke out when the sides accused each other of crossing into each other's territory. Similar fights have taken place in past years. No, not in Judea and Samaria. Erato Kozakou-Marcoullis said the Republic of Cyprus would be willing to let 40,000 to 50,000 Turkish settlers with Cypriot family ties remain on the island. Government officials from the Greek and Turkish halves of Cyprus are to meet next month at the United Nations to discuss an agreement on uniting the island, where large reserves of oil and gas have been found offshore. "Whether or not we will reach an agreement is yet to be seen,” said Dervis Eroglu, president of the Turkish Republic of Northern Cyprus, according to World Bulletin. Elizabeth Samson is a visiting fellow at the Hudson Institute and an attorney specializing in International Law and Constitutional Law and she has writtn on Palestinian Statehood and International Law for the inFocus Quarterly, Fall 2011 issue. ...The Palestinian Authority has explicitly stated its plans to use the UN declaration as a tool to make further claims against the Jewish state. As PA President Mahmoud Abbas explained in a May 16, 2011 op-ed in The New York Times, UN recognition of Palestinian statehood "would pave the way for the internationalisation of the conflict as a legal matter, not only a political one. It would also pave the way for us to pursue claims against Israel at the United Nations, human rights treaty bodies and the International Court of Justice." Further clarifying the PA's plan, in an interview printed in the Qatari newspaper Al Watan at the end of August and just weeks away from his bid at statehood, Abbas said, "when Palestine gains international recognition of a Palestinian state within the 1967 borders, it will be a country under occupation, thus our reference will be the United Nations (UN), and we will discuss our issues there according to article four of the Geneva convention." In short, the PA plans to use UN recognition to evade sitting down and negotiating a settlement to the decades-long conflict with Israel. Recognition will simply be another tool in the Palestinian arsenal used to delegitimize Israel in the international arena. My third blog post on him yesterday was, alas, premature. He continues to lie. Maen is mean. EoZ already has fisked his op-ed in the Washington Post entitled "Palestine, a history rich and deep". Rich and deep with prevarications and misrepresentations. His purpose in writing is "to tell you what the Palestinians, as a people, are all about." And what does he tell? a) "We go far back, much further than those doubting our existence can remember. Jericho, my home town, goes as far back as 10,000 B.C., making it the oldest continuously inhabited city in the world." Jericho has nothing to do with Arabs. b) "We Palestinians also happen to live in a place that many consider important, at the crossroads of three continents and containing a site of holy reverence for more than half of the world’s population." Yes, and the y all they can to combat other religions and cultures. c) "We lived under the rule of a plethora of empires: the Canaanites, Egyptians, Philistines, Israelites, Persians, Greeks, Romans, Crusaders, Mongols, Ottomans and, finally, the British." Canaanites, Egyptians, Philistines, Israelites, Greeks, Romans, Persians, Arabs, Crusaders, Mongols, Ottomans and, finally, the British. Secondly, since the Arabs arrived, as conquerors and then occupiers of someone else's county in 638 CE, - and that someone else were those "Israelites", he is claiming a false historical narrative. d) "Centuries of rule by an eclectic assortment have taught us that empires come and go but legacies and values remain." But they are part of that category of empires, the one that raged out of the Arabian Peninsula in the first third of the 7th century, some 16 centuries after the First Temple, 20 centuries after the Tabernacle was erected at Shiloh, where I live. e) "We proudly carry those values today. Family is sacred, education is indispensable, and religious tolerance is innate." f) "Many in the United States forget that Palestinians are Muslims and Christians. They ignore the fact that Palestinian Christians are the descendants of Jesus and guardians of the cradle of Christianity." So, no Jew can be a "Palestinian"? No Jew is a descendant of those who lived in Eretz-Yisrael since the time of Abraham, Issac, Jacob, Samuel, Saul, David, Solomon, Ezra? g) "Our recent history became intertwined with the plight of European Jewry seeking an end to centuries of persecution brought upon them by the West." Yes, and the Arabs of the Palestine Mandate joined up with Hitler and the Nazis. h) "Before World War II, Palestinians and Jews living in Palestine enjoyed times of great harmony." And when was that? In 1920 when the Arabs killed Jews in Jerusalem in a political pogrom? In 1921, when Jews were murdered in Jaffa? In 1929, when Jews were slaughtered and raped and mutiliated by the score in Hebron and in other communities? During 1936-1939 when over 500 Jews were killed in the "Arab Revolt"? i) "That period ended in 1948, however, and a conflict began." It ended when Israel was born, the Zionists having accepted (yet another territorial compromise called ) Partition and the Arabs refused and launched the war of 1947-1949 when over 6000 Jews were killed, most of them civilians. j) "It triggered our characteristic defense mechanism,"
So, terror is now a defensive mechanism, or did not terror come first, causing the Jews to be defensive? k) "We developed our political representation"
The PLO was an Egyptian invention and without the intervention of neighboring Arab countries, as early as 1930, the Arabs of the Palestinme Mandate would be nowhere on their own. l) "The two-state solution was this national platform. We agreed to confine our right to self-determination and statehood on only 22 percent of what used to be our historic homeland"
That two-state platform, if it does exist (and it still is the "stages solution", actually), was only adopted in 1993 at Oslo. m) "With our can-do spirit, we built the institutions of the state"
Those "institutions" are non-transparent, undemocratic, elections have been postponed for years, Hamas and Fatah are divided, killing each other, repressing each other and have trouble "reconciling". n) "We, the only remaining people under military occupation in the world"
Area A, where some 90% of the Arab population resides is under full PA control. And if there would be no terror, there would be no further "occupation". o) "We are the Palestinians whose roots are so deep in our land. We are an old, rich and hopeful people whose emancipation is incomplete. A people with a state recognized by 129 countries yet not completely free. A state interrupted. That’s what we’re about." No, not correct. Palestinianism is the negation of Jewish nationalism. There was no state ever of "Palestine" and nothing was interrupted. Up until the early 1920s, the Arabs requested to be considered as Southern Syrians and the country to be united with Syria. They are so "old" that they can't recall who they are. Arakeit, thank you so much for this piece of proaganda which will assist the Zionist effort to regain the true narrative in this conflict. I lived there with my parents and sister from April 1954 until August June 1970. The apartment in the Co-op was sold in 2002 following my father's passing in 2001 who remained there after my mother died in 1997. When Prime Minister Benjamin Netanyahu announced that the Likud party would hold early primary elections, the renowned spin doctors of Israel's liberal Left began to smell the stink of general elections. In a classic Pavlovian response, the ammunition comes out and poisoned arrows are fired in every direction. Spirited, serrated arrows sharpened for years by the best self-hating creative Jewish minds. An ancient self-hatred, violent and uncompromising, whose self destruction mechanism has proven dangerous multiple times throughout Jewish history. ...There are those among us who are willing to break Israeli society apart and turn it into dust for a few measly Knesset seats. There are those who raise the flag of tolerance and respect but only when it comes to non-Jewish minorities. There is another group that these knights of human dignity have in their sights: the 'settlers'. All of them, without distinction. Men, women and children who choose to deliver parts of Israel's historic legacy and settle in a reunited Jerusalem. Thanks to cruelty and malicious disinformation, they have become moving targets in the unrestrained shooting range of the media, which fires bullets of incitement at them. The media paints them as an obstacle standing in the way of peace, as lawbreakers and rowdy hilltop youth, as warmongers, as destroyers of the IDF, as land grabbers, as avoiders of singing women and what not. Palestinians must "thwart attempts to occupy it so it can be Judaised or controlled," [Barakeh] Taha said...Palestinians launched a counter-campaign to encourage their ranks to hold celebratory events like circumcision ceremonies and weddings at the site's mosque. "The Ibrahimi Mosque is for the Muslims and the Palestinians, not for the Jews nor for the settlers and I'm proud to be getting married in this magnificent place," said Lubna al-Natsheh, Taha's 19-year-old bride. "We will not abandon it," she vowed. "We will continue to come here and return one day with our children." The Palestinians say they will ask UNESCO to formally recognise their cultural attachment to the Ibrahimi Mosque in February -- a move only made possible by their admission to the UN body two months ago..."Now we can ask UNESCO to add our archaeological and religious sites to the World Heritage List," she said. "It's the main benefit we've won." In the name of the Satmar Rebbe, on the issue of the transfer of the ownership of the Meron grave area from the various hekdeshim religious trusts to a state authority - war! 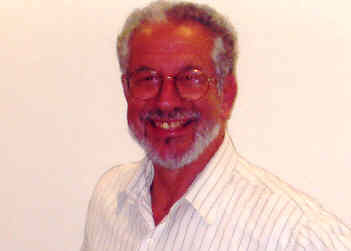 Remember Maen Rashid Areikat, the representative of the Palestinian Liberation Organization to the United States? Well, besides being a liar, he was interviewed by USA Today saying "no Jews allowed in 'Palestine'" that was later either denied or fudged. Hundreds of thousands of Jews live in communities in the disputed West Bank territories. To Israelis, the West Bank is known as Judea and Samaria, reflecting its crucial role in the ancient and modern history of the Jewish people. If a peace settlement is ever reached — a big if given the history of Palestinian intransigence — could some Jews living in the West Bank choose to opt to remain and pursue their lives under a new Palestinian state? No, according to Maen Rashid Areikat, the representative of the Palestinian Liberation Organization to the United States. In a recent meeting with the Chicago Sun-Times editorial board, he condemned the Jewish residents of the West Bank — he put the number at 550,000 — as unlawful settlers and declared that all of them must leave as part of any Israeli-Palestinian settlement. Areikat did acknowledge that a settlement would involve “minor” land swaps that could incorporate some of the communities in Israel. And he did say that at some point in the future, Jews might live in a new Palestinian state. Actually, is that a pun? That "a settlement would require Jews living in the Palestinian-governed West Bank to leave"? Remind me, who is practicing apartheid in our region? An Egyptian court ordered on Tuesday that forced virginity tests be stopped on female detainees in military prisons. The case was filed by Samira Ibrahim, a woman who said the army forced her to undergo a virginity test in March after she was arrested during a protest in Cairo's Tahrir Square. ..."The court orders that the execution of the procedure of virginity tests on girls inside military prisons be stopped," said judge Aly Fekry, head of Cairo Administrative court. Hundreds of activists inside the courtroom cheered after the ruling was read out. The most unsettling pages of this book involve Peres-Landau's paroxysms of partisanship concerning the Holocaust era. They contrast Jabotinsky's 1933 pooh-poohing of Hitler's Mein Kampf with Ben-Gurion's supposedly prophetic 1934 warning about the enormous threat to Europe's Jews, but that is less than a half-truth. In 1933, Jabotinsky told the 18th Zionist Congress that it was "duty-bound to put the Jewish problem in Germany before the entire world" and "destroy, destroy, destroy" the "murderers." Meanwhile, the Ben-Gurion clique, according to Jabotinsky scholar Yisrael Medad, was sabotaging every attempt by Jabotinsky's men to force the World Zionist Organization to take a "vigorous attitude on the German situation." No, not Meah Shearim or Bet Shemesh. The Palestinian Centre for Human Rights (PCHR) condemns the killing of M. A. by one of her relatives in Sheikh Radwan neighborhood in Gaza City on Friday, 23 December 2011, to "maintain family honor." ...According to investigations conducted by PCHR, at approximately 02:30 on Friday 23 December 2011, the body of M. A., 45, from Sheikh Radwan neighborhood, who was killed by strangulation, was brought to Shifa Hospital in Gaza City. According to the Forensic Medicine Department, M. A. was killed by strangulation using hands. According to Chief Ayman al-Batniji, Spokesman of the Palestinian Police, the victim's nephew, who is accused of committing the crime, turned himself in to the police. During interrogation, he said that he killed M. A. to "maintain his family’s honor." Investigations are still ongoing. And what if Abraham were to visit the Temple Mount? Yes, Abraham could not accompany Isaac on to the Mount, especially with wood and a knife. Actually, the comparison is worse. The reporter, Phoebe Greenwood, quoted a Father Ibrahim Shomali, a parish priest, who indicated Joseph and Mary would struggle to get into the city, let alone find a hotel room. "If Jesus were to come this year, Bethlehem would be closed," says the priest of Bethlehem's Beit Jala parish. "He would either have to be born at a checkpoint or at the separation wall. Mary and Joseph would have needed Israeli permission – or to have been tourists. This really is the big problem for Palestinians in Bethlehem: what will happen when they close us off completely?" A strip of Israeli settlements built on 18 sq km of what was once northern Bethlehem threatens to cut the city off from its historic twin, Jerusalem. But since Bethlehem and Jerusalem were historically Jewish (David was made king in Bethlehem and then mvoed to Jerusalem, for example), one need inquire what "history" is she refering to? Made up Arab history? Secondly, Mary and Joseph were Jewish. On the way to Bethlehem they could have gotten shot or stabbed or, at the least, stoned by Arabs. More "There Goes The Demography Threat"
The total fertility rate declined in 2010 to 4.2 births compared with 6 births in 1997. The rate in the Gaza Strip in 2010 was 4.9 births compared to 3.8 births in the West Bank, which have been stable for the past few years with no significant changes. The report indicated a decrease in the average household size in the Palestinian Territory which reached 5.8 persons in 2011 compared with 6.4 in 1997: 5.6 persons in the West Bank and 6.3 persons in the Gaza Strip. PCBS said the crude birth rate is 32.8 births for every 1000 of population: 30.1 in the West Bankcompared to 37.1 in Gaza Strip. The rate is expected to decline to 31.9 in 2015. The crude death rate is 4.0 deaths for every 1000 of population: in the West Bank the figure is 4.1 compared to 3.9 in Gaza Strip. The rate is expected to decline to 3.6 in 2015. Mohammed Shtayyeh, member of the Fatah Central Committee and one of the Palestinian Authority negotiators with Israel, was quoted Sunday as saying that the Palestinians may cancel the agreements signed between the PLO and Israel...In response to a question about Israeli settlements, Shtayyeh said: "If Israeli Prime Minister Binyamin Netanyahu insists that there is no difference between the settlement of Abu Ghneim [Har Homa] and Tel Aviv, we won't distinguish between Ramallah and Jaffa." ...Shtayyeh explained: "The recognition of Israel was not a balanced recognition. The PLO recognized Israel in the geographic sense, but Israel did not recognize Palestine geographically, but as an institution. Israel only recognized the PLO. Now we are demanding a mutual recognition. We want Israel to recognize the Palestinian territories of 1967." Of course, the minister has it backwards, as usual. As Palestine Media Watch has proved with its studies and monitoring, and others as well, the PA does not recognize Israel, not intrinsically as an expression of Jewish nationalism and neither in its geography of borders. Israeli cities and regions are "Palestine". They teach and they broadcast that there is no difference between Haifa and Beersheba and Bethlehem and Shchem. The PA symbols eliminate Israel from maps. The educational system does not instruct the existence of Israel in any positive fashion. No peace or coexistence programs are run. It's all a fake. The ungenuine peace. The false recognition ploy. Jeffrey Goldberg seems to delight in taking a swipe at fellow Jews. What Gibson didn't mention was the doughnuts. The doughnuts are very important. I'm off to find the doughnuts. I'll be skipping the Lubavitcher lighting of the world's crassest menorah outside the White House. Getting the doughnuts seems more important. See you tomorrow. Preferring to gain weight rather than observe the lighting of Hanukah lights is probably crass itself but there is something else that bothers me about this. [Absorption] Minister [Sophia] Landver is worried about my children's Jewish future, I thought I would issue an invitation: The next time she visits Washington, she is invited to Shabbat dinner at my home. She can quiz my children about their Jewishness, and she can observe a Jewish family in America being, well, Jewish. We'll make a very nice dinner, and we'll have a very interesting conversation. I'm serious, by the way. Please, don't grow up and act like your father. Don't refer to a symbol of Jewish religious practice, of national legacy and cultural heritage as crass, even if it is. Be generous with your fellow Jews, especially if their contribution is actually strengthening Jewish identity, even as a mosaic. Don't demean any Jewish expression of proud identification with a great people just to find favor with your friends or your readers, if you choose to be writers. That would be a non-Jewish and a crass thing to do. Can you imagine this speech being made by an Israeli leader? One made as yet another war the Arabs have foisted on to Israel is coming to an end? No, I couldn't imagine it either. But that speech was indeed made. It was broadcast over the BBC on March 20, 1945 by Thomas Mann and directed at Germany. 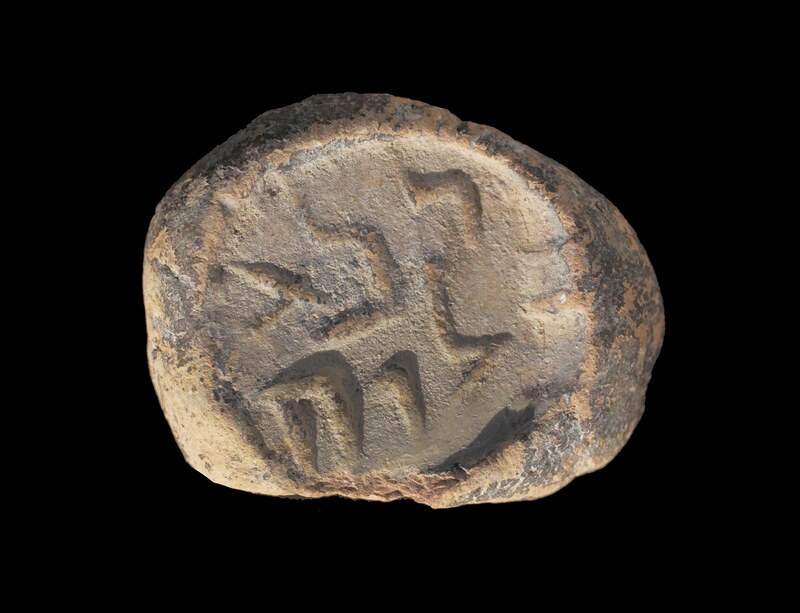 The Israel Antiquities Authority on Sunday presented a rare clay seal that appears to be linked to religious rituals that took place at the Second Temple 2,000 years ago. The coin-sized seal found underground near the Western Wall in Jerusalem's Old City bears two Aramaic words meaning "pure for God." Archaeologist Ronny Reich of Haifa University said on Sunday that this was the first discovery of such a seal from the period and a unique artifact from the Temple practice. He said the seal was likely used by Temple officials assigning an object for ritual use — oil, perhaps, or an animal intended for sacrifice. Materials used by Temple priests had to be ritually pure. Reich added that the seal dates from between the 1st century B.C. to 70 A.D., when Roman forces destroyed the Temple. While the purifying process has been documented extensively, it was never been fully proven until now. The seal impression clearly attests to the special purity measures that worshipers subscribed to in and around the Temple and the great lengths they went to in order to prepare themselves for the privilege of entry to the Temple area. Jews. In Jerusalem. At the Temple. What will the Arabs say? that the inscription is clearly in Aramaic, not Hebrew. This would be highly unusual for a priestly item. Deutsch offers an alternative theory that the seal was a token used in the monetary exchange for a libation offered in the temple. The use of Aramaic in this case would make more sense, as a lay person was involved in the exchange. However, the phrase ‘pure for Yaw(weh)’ seems a little peripheral to the exchange itself. I want to propose a slightly different understanding of this little seal. Jerusalem with whatever coins they had, and would go to an officially sanctioned moneychanger in or near the temple complex. They would hand over their coins, receive Tyrian silver in exchange, as well as a token (the seal) guaranteeing the purity of the silver they were receiving...the token was written in Aramaic so that a lay person (a pilgrim) might understand that they had received pure currency that was officially endorsed by the temple authorities. The pilgrim would then take these Tyrian silver coins, along with the accompanying token, and use them to make purchases, such as sacrificial animals or libations, within the temple itself. Will The Next Discovery Be Eve's Apple Core? Harvard University educated archaeologist and director of the Paleontological Research Corporation, Dr. Joel Klenck, surveyed and completed a preliminary analysis of two sites on Mount Ararat in Turkey discovered by a Kurdish guide, Ahmet Ertugrul. “The research areas are noteworthy”, states Klenck, “and comprise a large wood structure and cave with an archaeological assemblage that appears to be mostly from the Late Epipaleolithic Period.” These assemblages at other sites in the Near East have calibrated radiocarbon dates between 13,100 and 9,600 B.C. Gunshots were sprayed at a group of people walking near the Westbank Expressway on Saturday, injuring three people. TERRYTOWN, La. 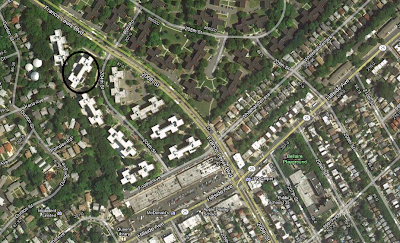 -- Three people suffered non-life-threatening injuries on Saturday when shots were fired along the Westbank Expressway. Officials with the Jefferson Parish Sheriff's Office said the incident happened about 3 p.m. where the freeway meets Terry Parkway. All three of the victims are 17 years old. A family member told WDSU that five people were walking, with an infant, to Oakwood Center when shots were fired from a passing vehicle. The car was driving on the lower portion of the expressway. Join Likud Anglos this Hannukah in welcoming a modern-day Macabee, Moshe "Boogie" Ya'alon. Ya'alon is Vice Prime Minister, Minister of Strategic Affairs, and a member of the Prime Minister's "inner security cabinet." As IDF Chief of Staff, Ya'lon objected to the Disengagement Plan and his term as Chief of Staff was therefore not renewed. The Minister will address the security threats facing Israel and will take your questions. We will also be honoring Modern-Day Macabees -- Lone soldiers. It'll be today, Sunday in Jerusalem. Are Arabs "Price Taggers"? Or The Real Terrorists? There was a bit of the usual internal Israel bickering whether the "price tag" phenomenon is "terror". Israeli forces on Saturday morning closed all the entrances to the northern West Bank village of Azzun east of Qalqiliya preventing all residents from going in or out. Locals told Ma’an a large number of troops stormed the village in the morning. The soldiers completely shut down the northern and the western entrances before they ascended to the roof of a local resident’s home and started ransacking houses for inspection. Onlookers said the soldiers claimed to have come under fire. ...Police and security forces, including Ephraim Brigade deputy commander Tzur Harpaz, responded to the scene of the attack. Soldiers entering the village reportedly shut down the northern and the western entrances before they ascended to the roof of a local resident’s home and started going house for house in search of the terrorist...It is currently unknown whether IDF forces found the terrorist during the search. Maaleh Shomron is the home of Yesha Council Chairman Dani Dayan and he informs that he passed the spot but 10 minutes earlier. Where has Mr. Ben-Ami been? In 1993, Israel entered the Oslo process with Yasser Arafat and the Palestine Liberation Organization. The process was intended to lead to final-status talks on the West Bank and Gaza Strip by 1998, but Palestinian terrorism, not mentioned by Mr. Ben-Ami, sabotaged it. In 2000, Israel and the United States proposed to the PLO a West Bank and Gaza state, with East Jerusalem as its capital, in exchange for peace with the Jewish state. Bold, even risky. But this, too, Arafat rejected and soon after launched the “al-Aqsa intifada,” in which more than 1,000 Israelis and 4,000 Palestinians died. The offer was repeated and again rebuffed in early 2001. With Mr. Ben-Ami’s “land swaps” included, it was made by Israel and rejected by the Palestinian Authority (PA) in 2008. Mr. Ben-Ami, the president of J Street, which calls itself a “pro-Israel” and “pro-peace” organization, did not mention these inconvenient facts. He was silent, too, on the 2006 triumph of the terrorist organization Hamas in Palestinian elections. He also said nothing about Hamas’s violent takeover of the Gaza Strip the next year. Likewise, he was mute on recurrent rocket and mortar attacks from the Gaza Strip and on incessant anti-Israel incitement by the Fatah-led PA in the West Bank. I have a simple definition to offer: To be “pro-Israel” is to respect Israel, its elected leaders and its policies. Israelis are not to be treated as pawns, with their fates dictated by foreigners. There are risks in whatever course Israel chooses. But since Israelis are the ones who would suffer any consequences, they, and they alone, have the right to chart that course, just as we Americans get to choose our destiny. There is no way to defend a divided Jerusalem when half calls for the destruction of the other side. Nevertheless, were the Israeli people to decide such a course, I would accept that decision, because I respect Israel and its elected leaders. I have nothuing to add. No, not at Shiloh in Benjamin Region of the Land of Israel but in Los Angeles, West Pico, land of the Jews. Shiloh's is a restaurant. One where a new generation of gourmet go-tos go. Fusion food between traditional and haute-cuisine. What seems to be a great steak house. If anyone has been there and sampled the menu, let me know. The Meaning of The Carribean Band's New Song - "Melancholy Sarcasm"
My bandmate Matt Byars forwarded me your email. I appreciate the question. Since I wrote the song, I'm happy to be able to respond. The song is neither anti- or pro-Israel, which probably sounds like a cop-out. Maybe it is. Like so much of what I write, the words are fairly impressionistic and largely built around the sound of words in a melodic context. That's how I write. It's what I like. The song itself -- and certainly the title -- points to the emotionally, historically, politically, and racially-garbled discourse about Israel in my country. The answer to any question like "What do you think about Israel?" or "What do you think about the Middle East conflict" often winds up having less to do with Israel or Palestine than the answerer's own hopes, fears, and motivations. In the U.S., it is incredibly difficult here to have a rational, nuanced conversation about Israel. This seems especially so within the Jewish community, which, I fear, often takes a very black-and-white view of the matter. As an American, a Jewish American of Belarusian descent, I understand this, but I also believe it impairs our ability to relate, as people, to one another. That's all that's really important to me. People relating to other people. Remember that? I don't think the question is ever 'Are you pro- or anti-Israel?' No one I know believes that Israel shouldn't exist in peace. One can (and should) believe in the dignity and human rights for all people and be strongly "pro-Israel" while one can believe in the notion that only one people is worthy of God's favor and all others, Jews included, are ticketed for hell and still be strongly "pro-Israel." So pro-/anti- is completely without meaning. The questions, for me, are usually this: Is the Israeli government good for Israel? Is it good for Jews all over the world? Is it good for free people all over the world? Is it good for me? The answers are important, but the questions are a prerequisite and few Americans, Jewish or otherwise, ever reach them. People here don't talk about Israel; they use Israel as a symbol for pain, resentment, and anger over the Holocaust and a history of persection or distrust or dislike of Arabs or desire for oil or desire for the end-of-the-world and the Rapture or desire for political advantage . . . Straight talk, from either side of the debate, is usually shouted down before it can take root. When answers aren't easy, people are more likely to answer easy questions that aren't asked. That's what we have in the U.S. There are principled people on both sides of the Middle East debate, I'm sure, but it's hard to see that. I make no apologies for being critical of Israeli policies viz the Palestinian Question, but I'd hardly call myself a "radical progessive." Radical progressives would probably dismiss me as a lightweight or a weekend radical (untrue because Tuesdays and Fridays are my most radical days). You might think of me as a radical progressive because I read Haaretz, but, really, I'm just Michael. Me. I like people. I believe in the grey area. I believe in the existence and charter of Israel, but I do so, I hope, honestly and with some understanding of how things came to be as they are. The beauty and sanctity of Israel, like that of America, is steeped in some really ugly stuff as well as some shimmering glorious ideals. It's grey. That's OK, but let's call it. I believe that victims of persecution are twice burdened: once by the persecution, again by the anguish of seeing anyone else subjected to abuse. To the extent any of us are victims -- directly or historically -- we have a responsibility, because of our understanding of what it's like to suffer such treatment, to, at the very least, refrain from doing the same to anyone else. Not an arguable point; it's just what I believe. I'm not sure how that defines me, but I have been called much worse than "radical progressive." I have read knee-jerk reactions of those on my "side" of the Question that embarrass me and set the discussion back. I also have family members who refer to Arabs in terms indistinguishable from how Jews were characterized by the Third Reich. In my country, we have people who want, among other things, a free and fair Israel and the independence and safety of all Jewish people called antisemitic or my favorite mean-nothing term, "self-hating Jew," (talk about a racist term!) by other Jews as well as by non-Jewish, religious Right politicians who see a "spiritual" opportunity in the Middle East conflict hoping Jews flush themselves along with every other non-believer down the eternal toilet. We're a very long way from reaching any principled answers here. which is always a legitimate question. But thanks, Michael. That was very important. The parameters and content of public discourse, on all sides, need to be constantly reviewed, debated and challenged. As well as researched and checked against truth, historical and contemporary. Unidentified gunmen on Friday opened fire on the home of a local Fatah leader in the Jordan Valley. Muhammad Abu al-Zour came under fire around midnight on Friday as he stepped out of a car outside his home. He was not injured in the incident although material damage was reported, a Ma'an correspondent said. Secretary general of the Fatah movement in Nablus Mahmoud Shtayyeh denounced the attack. Palestinian factions, including Hamas, are "on the path joining" the Palestine Liberation Organisation, Hamas chief Khaled Meshaal told AFP Thursday following unity talks with Palestinian president Mahmud Abbas..."This is a new departure on the path to joining the PLO of all Palestinian movements", Meshaal said following the talks in the Egyptian capital. The Hamas leader said there was "an excellent atmosphere" surrounding his meeting with Abbas, which also included Egyptian intelligence chief Murad Muwafi and Palestinian independents. Independent MP Mustafa Barghouti said the participation of unaffiliated delegates such as himself and businessman Munib al-Masri alongside representatives of Hamas and Islamic Jihad was "a historic event." So, are we on the verge of unity or yet another phase in the tribal and/or factional internecine warfare of this invented people? The Hamas premier of Gaza, Ismail Haniya, praised steps toward reconciliation taken by the Islamist group and its former rival Fatah, which were angrily denounced in Israel...“We want to pursue positive dialogue with Fatah from this point,” Haniya told journalists. “Practical measures must however be taken, like the liberation of political prisoners from Hamas detained by Fatah,” he said, adding that Fatah must also stop its repeated questioning of Hamas supporters during investigations. The reconciliation moves drew an angry response from Israel...“This alarming rapprochement between Abu Mazen (Abbas) and Hamas is aimed at forming a government that one can only say is aimed at bringing about a genocide,” Transport Minister Israel Katz of the right-wing Likud party said. “Since the dark days of Nazism, no other movement has set as its aim the killing of Jews,” he charged. we need ask: Is the future to be one of reconciliation or one of eliminating rivals? Or joining forces against Israel? Is This About That Israel Fence? Look! Jews on the Temple Mount! Are You A Good Judge of Songs? Bill Clinton - Do You Believe Him? Who Will Be Singing Carol in Bethlehem?